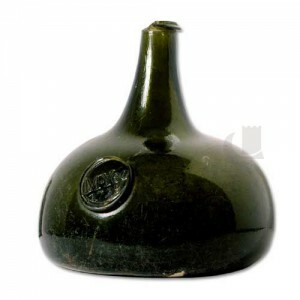 Before 1600, bottles were usually made of pottery or leather but by the middle of the century the ‘new’ black / dark green glass wine bottle had come into general use. Early glass bottles were squat, broad and rounded but around 1800 they became taller and more angular, quite similar to modern bottles. After c.1650 glass seals were often added to bottles, bearing the owner’s name and usually a date (This bottle bears the seal of ‘M.Yeo 1728’). In 1615 the Government, concerned at the destruction of the forests, banned the use of timber as fuel in glass-making furnaces. Glassworks were then set up near to supplies of coal and by 1678 one was operating in the middle of Swansea. Here there was a good harbour, cheap coal and plenty of seaweed (seaweed ashes were used in the glass-making process). The Swansea Glassworks was set up inside the town’s disused castle. Squat black wine bottles were produced and by 1696 it was one of 37 glassworks spread across England and Wales. It was set up by Robert Wilmott of Gloucester and John Man of Swansea. Wilmott leased space in the castle, from the Duke of Beaufort, for seven years from 1684. Although work must have begun earlier because the words ‘glass house’ appear on a sketch of the castle by Francis Place in 1678. Wilmott sold the lease to his partner in 1686. Very high tax was imposed on glass-making in 1695 and although it only lasted for two years it may have been enough to close John Man’s glassworks in 1696.